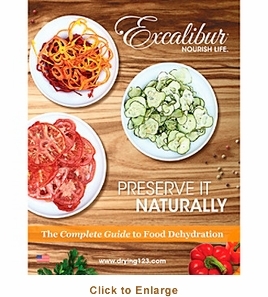 You�re viewing our Excalibur Preserve it Naturally guide book. 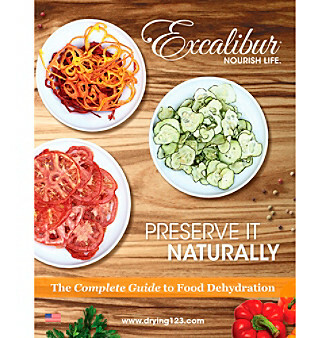 Excalibur's Preserve It Naturally: A Complete Guide to Food Dehydration is a book to guide you step by step when learning how to dehydrate food using a food dehydrator machine. This guide book is ideal for the beginner dehydrator as well as seasoned dehydrating fans looking for new ideas and recipes. The book uses full color photos with chapters on hot/cold appetizers, raw foods, main and side dishes, dairy products, sauces, beverages, soups, salads, breads, desserts, trail mixes, snacks and more. The book also has chapters and instructions for cake decorating and crafts like macrame beads, dough art, wreaths and potpourri sachets. 192 pages. If you have questions about our products we have the answers you need. Scroll down to view our Excalibur Preserve it Naturally guide book.